On September 15th (yes this is almost 3 weeks ago), the proposal to keep the Carleton Hall, and to allow the proposed new hall committee to operate it, finally went before the Council Management Committee. 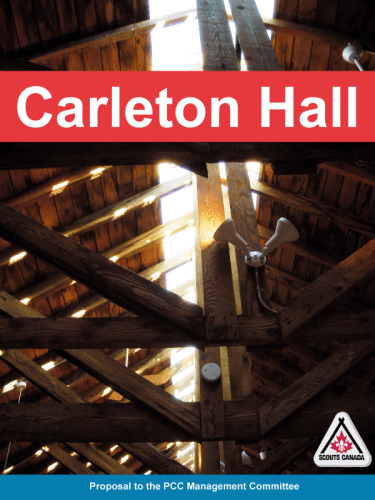 The document, as provided, is available here: Carleton Hall Proposal v2 [.pdf]. Representing the team at the meeting was Mark Burge and myself. Yesterday I presented this proposal (pdf above) to a select group of area and council representatives to review its substance. This meeting was not a decision making meeting, but a discussion meeting. While the general consensus was favourable, there are still gaps to fill in the plan. What follows is the discussion and how we aim to improve the plan. Two days ago, a decision was made to sell the Carleton Hall in East Vancouver at the end of this Scouting Year.